Golden straw color. Aromas of roasted pineapple, cinnamon flan, toasted walnut, sage, and lime curd in toasty pastry with a satiny, crisp, dryish medium body and a smooth, stimulating, long wood grilled mushrooms and carrots, whipped topping, rose petal, and sweet herbs finish with moderate oak flavor. A fabulous expression of Napa Chardonnay with well-integrated oak and a sophisticated style. Bottom Line: A fabulous expression of Napa Chardonnay with well-integrated oak and a sophisticated style. 94 • Jarvis 2014 Estate Grown Cave Fermented, Chardonnay, Napa Valley 14.7% (USA) $68.00. 96 • Jarvis 2014 Finch Hollow, Chardonnay, Napa Valley 14.8% (USA) $115.00. 89 • Jarvis 2014 Unfiltered Finch Hollow, Chardonnay, Napa Valley 14.8% (USA) $130.00. 92 • Jarvis 2012 Cabernet Franc, Napa Valley 14.5% (USA) $105.00. 94 • Jarvis 2011 Cabernet Sauvignon, Napa Valley 13.9% (USA) $150.00. 93 • Jarvis 2010 "Lake William" , Napa Valley 13.8% (USA) $170.00. 94 • Jarvis 2012 Reserve, Merlot, Napa Valley 14.8% (USA) $200.00. 90 • Jarvis 2010 Petit Verdot, Napa Valley 13.4% (USA) $120.00. 89 • Jarvis 2013 Will Jarvis’ Science Project, Cabernet Franc, Napa Valley 14.3% (USA) $140.00. 85 • Jarvis 2013 Tempranillo, Napa Valley 13.2% (USA) $85.00. 96 • Jarvis 2007 Reserve, Cabernet Sauvignon, Napa Valley 14.5% (USA) $260.00. 92 • Jarvis 2016 Estate Grown, Chardonnay, Napa Valley 14.2% (USA) $75.00. 92 • Jarvis 2016 Finch Hollow Vineyard, Chardonnay, Napa Valley 14.7% (USA) $135.00. 90 • Jarvis 2016 Finch Hollow Vineyard Unfiltered , Chardonnay, Napa Valley 14.7% (USA) $150.00. 92 • Jarvis 2014 Estate Grown, Tempranillo, Napa Valley 14.1% (USA) $85.00. 94 • Jarvis 2013 Estate Grown, Cabernet Sauvignon, Napa Valley 14.7% (USA) $165.00. 93 • Jarvis 2013 Estate Grown, Merlot, Napa Valley 14.7% (USA) $105.00. 92 • Jarvis 2013 Reserve, Merlot, Napa Valley 14.6% (USA) $230.00. 92 • Jarvis 2013 Lake William Red Blend Estate Grown, Napa Valley 14.8% (USA) $215.00. 85 • Jarvis 2012 Estate Grown, Petit Verdot, Napa Valley 13.2% (USA) $155.00. 90 • Jarvis 2014 Will Jarvis’ Science Project, Cabernet Franc, Napa Valley 14.4% (USA) $150.00. 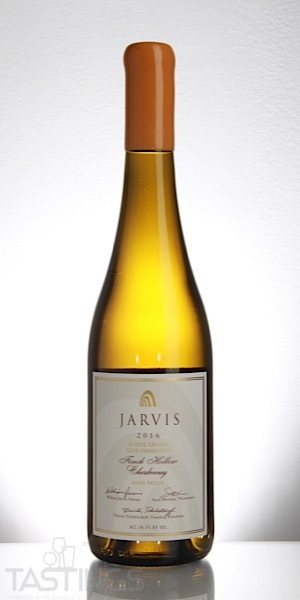 Jarvis 2016 Finch Hollow Vineyard, Chardonnay, Napa Valley rating was calculated by tastings.com to be 92 points out of 100 on 10/2/2018. Please note that MSRP may have changed since the date of our review.